US stocks rallied at the start of Wednesday's trading, extending Tuesday's gains as a painful October came to a close. General Motors and Facebook added to markets' buoyancy, with their shares soaring on good earnings news. 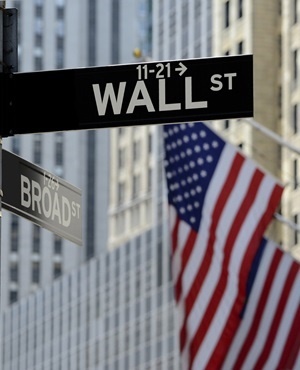 Despite the rally, the three major Wall Street indices were still poised to close the month with heavy losses. About 10 minutes into the day's trading, the Dow Jones Industrial Average had gained 0.9% to 25 109.43. The broader S&P 500 was up 1.1% at 2 712.46 and the tech-heavy Nasdaq was 1.8% higher at 7 289.01. Patrick O'Hare of Briefing.com wrote Wednesday that investment funds had supported Tuesday's rally through short-covering and boosting their equity weightings after the October rout. "Lest we forget, there is also the abiding sense that the stock market has gotten oversold and is due for a meaningful bounce," he wrote. The payrolls firm ADP reported on Wednesday that US job creation was unexpectedly strong in October, with employers adding a net 227 000 new positions. Meanwhile, the Labour Department also reported that US workers had seen the largest year-on-year jump in wages in 10 years. Both conditions could support Federal Reserve plans to continue increasing interest rates but markets appeared unmoved by such concerns. General Motors rose 6.5% after reporting earnings of $2.5bn - up from a loss of $3bn in the year-ago period when results were hit by a one-time accounting charge. Facebook jumped 5.8% after Tuesday's earnings report, which showed a 9% jump in quarterly profit. Sprint also rocketed 11% higher after beating earnings expectations.